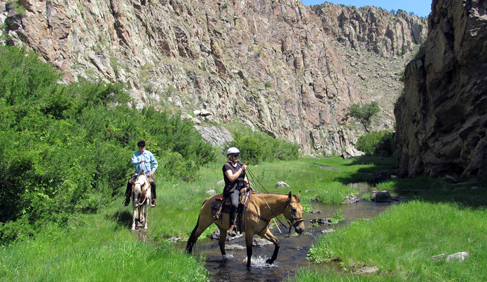 Ride through spectacular deep canyons and across crystal clear streams. 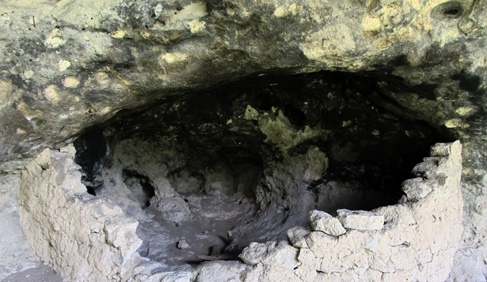 Explore 1,000 year old Cliff Dwellings. Enjoy responsive, well cared for horses and comfortable tack. Gather together for delicious meals. Escape. Explore. Experience. Open March through mid-November. 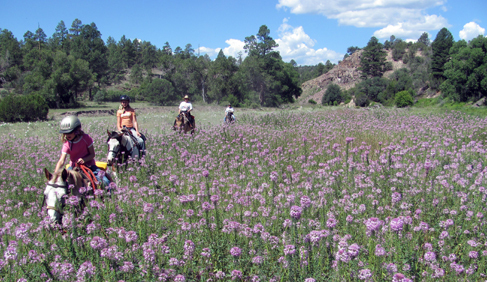 Horseback riding and hiking takes you through open meadows, tall ponderosa forests, up on high hills where the views go on forever across the 3.3 million acre National Forest, and down into deep canyons with sheer cliffs and crystal clear streams. 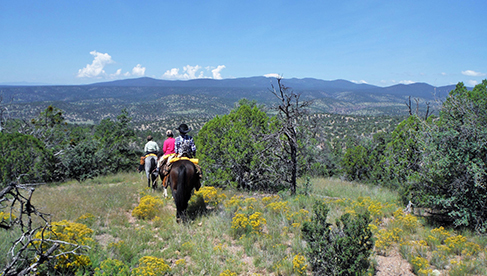 There is no end to the variety or beauty of the scenery at this New Mexico guest ranch. 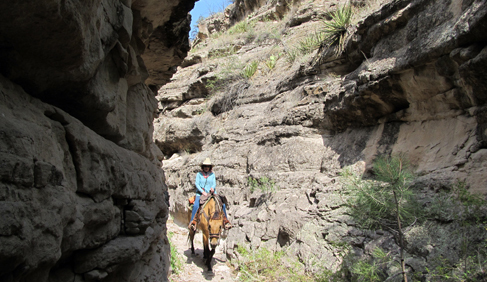 The trails start at Geronimo Trail Guest Ranch's backdoor with millions of acres to discover. 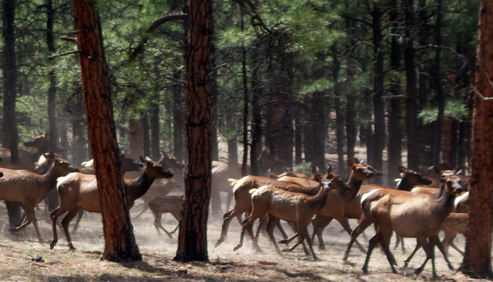 Wildlife is abundant and it is common to see elk, mule deer, javelina, eagles and more. The ranch horses (mainly Quarter horses and Paints) are well mannered and responsive. 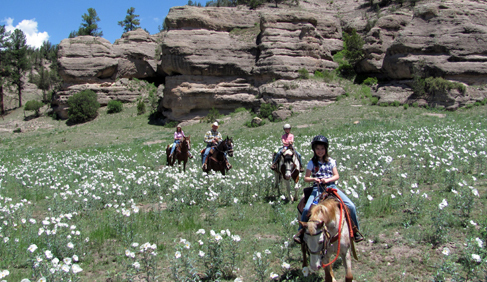 This guest ranch has a good variety so wranglers can match any ability rider. One of the ranch's guests made this comment, "We like everything about your ranch but we especially like the way your horses are loved and treated." 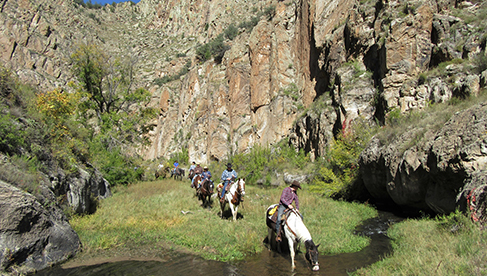 This is a real western adventure and you won't find better horseback riding anywhere! 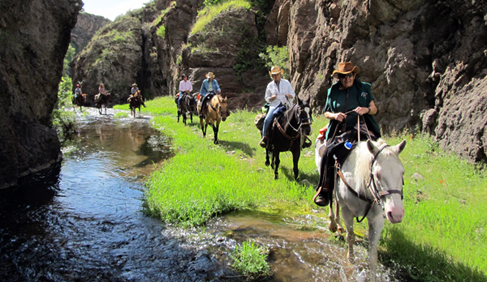 Geronimo Trail Ranch does not require you to stay in a line “nose to tail” all the time and does offer trotting and loping for capable riders where the terrain allows. 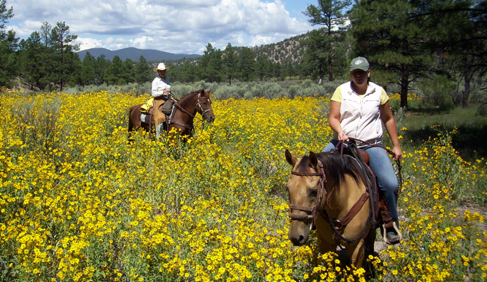 Our main focus is on trail riding: seeing the beautiful scenery from horseback, and making this a special vacation for you. No lines or schedules here! You can ride as much as you want or not at all.... the choice is yours. 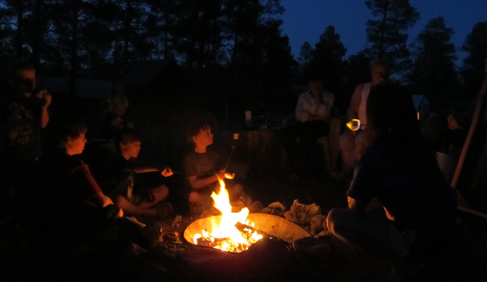 Other activities that our guests enjoy are seeing 1,000 year old archaeological sites right near the ranch, campfires at night (sometimes with s’mores and sing-a-longs! ), fantastic stargazing, unguided hiking, outdoor and indoor games, roping lessons, photography, swimming in the creek, or just reading a good book on one of our bench swings. 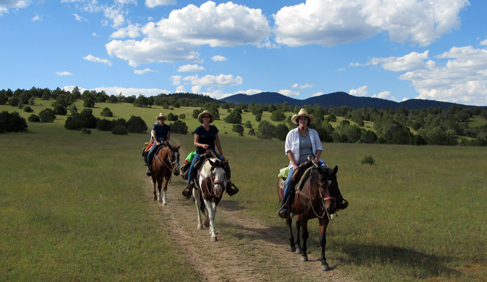 Since this guest ranch is in the mountains, there are moderate temperatures all year round. One great bonus of living at this altitude is that this guest ranch is almost bug free, so it's the perfect place for all outdoor activities. 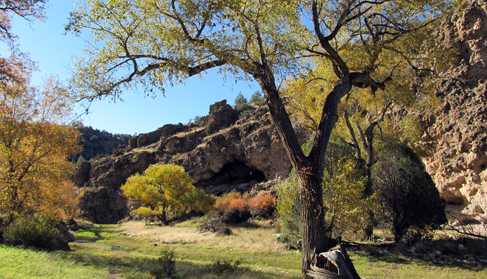 This southwestern guest ranch has lots of sunshine with those turquoise New Mexico skies that invite you to spend your time outside! 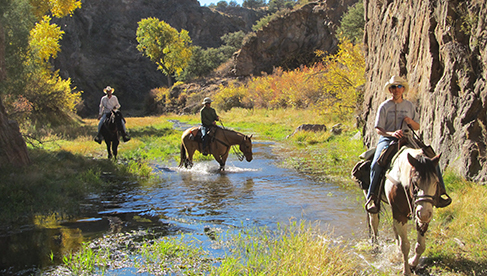 Geronimo Trails Guest Ranch- New Mexico- 10% Discount for Fall 2018 Reservations! 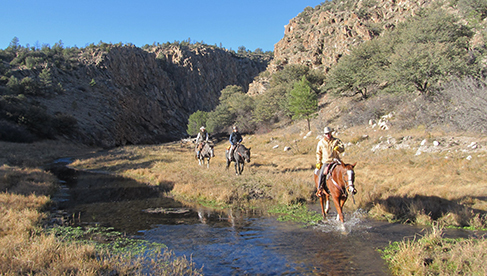 Ride through spectacular deep canyons with crystal clear, spring-fed streams. 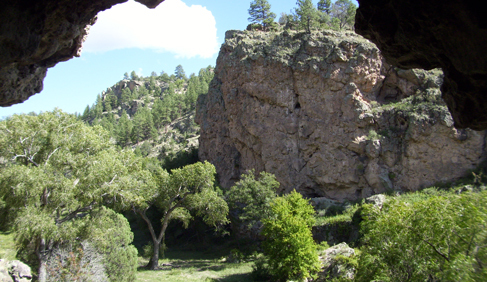 Take in the 3.3 million acre Gila National Forest from mountain overlooks. 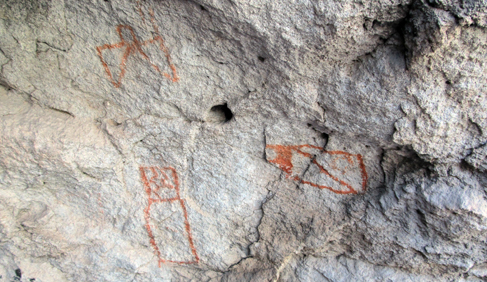 Explore pit houses and cliff dwellings from the Mimbres people who lived here over 1,000 years ago. Enjoy well-trained, responsive, well cared for horses and comfortable tack! Enjoy the peace and quiet at our small ranch! Escape. Explore. Experience. Open through mid-November. Lots of sunshine and turquoise blue New Mexico skies! Wildflowers in September changing to beautiful fall colors in October and November. 10% Discount off fall 2018 Reservations! Learn more and be sure to mention "Equitrekking"! Email Geronimo Trail Guest Ranch. 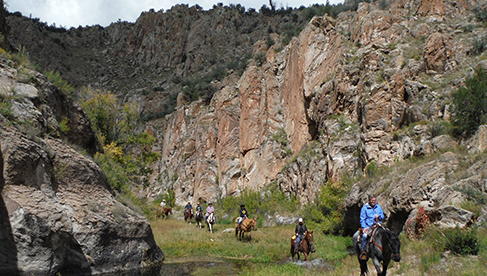 Visit Geronimo Trail Guest Ranch’s Website. 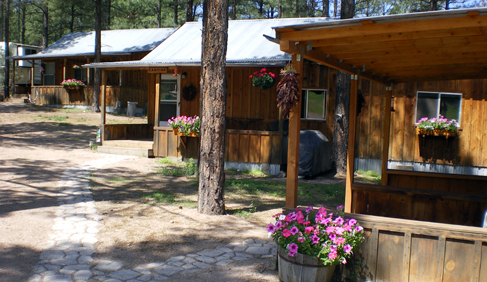 Geronimo Trail Guest Ranch's Ponderosa cabins nestled in the pines are comfortable and cozy with fireplaces, queen, twin and bunk beds, coffee maker, full bath/shower, sitting area, covered porches, and a cookie jar filled with homemade goodies. 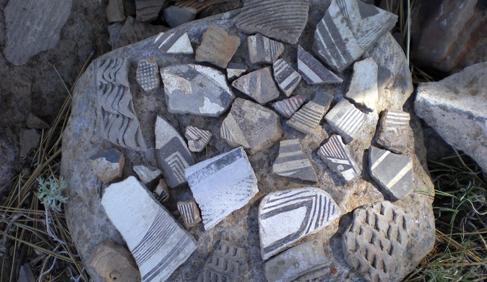 They are furnished in Native American style or Cowboy motifs. Meals are served in the dining room or outside on the ranch's picnic tables. Some of Geronimo Trail Guest Ranch's popular dishes include grilled salmon or trout, pork tenderloin, steak cookout, garden fresh vegetables, New Mexican scrambled eggs, blueberry pancakes with fruit and the chef's famous flan (and other incredible desserts!). Ranch hosts get many compliments on their fine dining and Geronimo Trail Guest Ranch can satisfy any dietary needs. While this New Mexico guest ranch does not have a liquor license, you are welcome to bring your own. 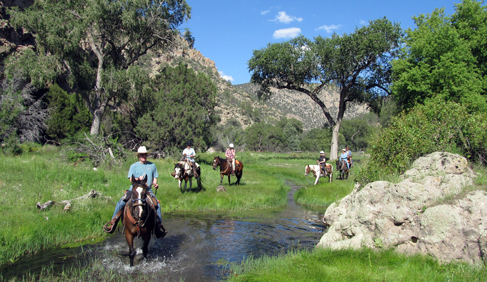 Trail Riding, Western riding, campfires, stargazing, sing-a-longs, line dancing, swimming, unguided fishing and hiking. Learn more about upcoming dates, rates and special weeks.